Low Vision: Do you have poor vision even with glasses? 63 per cent of people with sight loss are female, 37 per cent are male. Estimated two million people in UK living with sight loss. If you still have problems seeing clearly even with up to date spectacles you may have Low Vision. A low vision assessment can help to identify any problems you have and to suggest how to best utilise your vision. 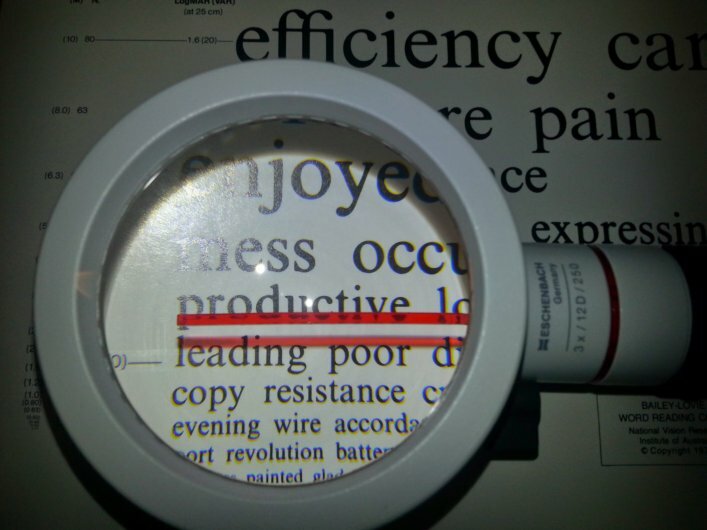 The most common example of this is using a magnifier to make small print bigger but there are other low vision aids and advice available. The service is free of charge and the Low Vision aids are loaned to you for as long as they are useful. Normal spectacles may be needed to get the most out of your Low Vision aid but these are not provided on the scheme. The Scheme is available for all patients registered to a GP in the North Tees or the South Tees area. To enter the scheme you will need to have had an up to date sight test in the last year. Your current optician or ophthalmologist will be able to tell you if you meet the requirements (6/18 or less in BE or N9 or less in BE) and they will be able to provide you with a referral into the scheme. If your last sight test was longer than a year ago another sight test would be required with your optician before entering the scheme. If you do not have an opticians in the area we will happily do a sight test for you but there may be a charge for certain patients. anything that can help assess your visual tasks at home, e.g. crosswords, books, newspapers etc. Mr Iain Mellis is a qualified Optometrists with a Professional Certificate in Low Vision, registered to do the scheme at both Mellis Eyecare practices.